India is a bustling buffet of magical scenery and non-stop action, and this is your once-in-a-lifetime journey to see, do, and experience as much of it as you can. 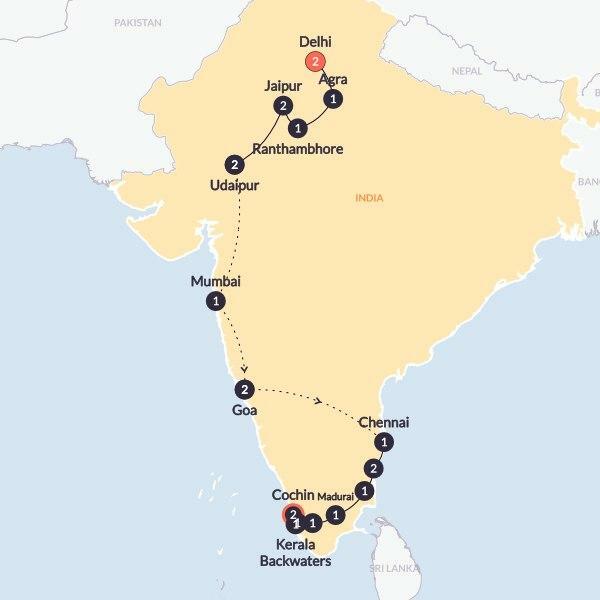 Set your senses alight on the ultimate adventure from north to south: take a sojourn to where the spices grow, glimpse the rose-tinted splendour of the Taj Mahal, and drift in a bamboo houseboat through the backwaters of Kerala. Get ready to have your perception of the world changed forever. What’s up Indian explorers! Who’s ready for an intoxicating dose of spice, flavour, yoga, beauty,colour, culture, and everything else wonderful that India can provide? The next 22 days are likely tobe some of the best of your life so get ready for some serious memory making, starting off withmeeting your new travel fam this evening. Wake up with a smile this morning as you remember exactly where you are, knowing today isentirely yours to do as much, or as little, as you want. Spirituality is a big part of the Goa experience,so start your day with some optional yoga on the beach, clearing your mind and stretching yourtravel tired limbs. Tonight is our final night in Goa, so makesure you do it right. Sunset and beers on the beach ticking the boxes? We may be parting ways with some of the group today but there's so much more to look forward to. After breakfast, take a flight to Chennai and keep this adventure going.Welcome to Southern India! Unite with the team for a pow wow before having a free evening to unwind in our hotel or take to the streets to suss out this city. This morning we’ll peel back the layers of Chennai, seeing Kapaleeswarar Temple and St Thomas’s Church, driving along Marina Beach & walking through the markets by the Chennai Fort. Now starting to feel acclimatised to life in India, we kick on to our second destination.Our journey through Tamil Nadu will see us stopping at Mahabalipuram Shore Temple & the peculiar boulder of Krishna's Butterball. Arriving in ‘Pondy’ we’ll find a delicious fusion of French beauty & Indian soul, and have a free evening to enjoy it how we see fit. Today you can jump onto an optional Heritage Walking Tour to go deep into Pondicherry’s unique history. You can then devour cake and coffee at ‘Eat My Cake’, a café run by local widows, and visit the progressive experimental township of Auroville. A vegetarian lunch in a solar powered kitchen will warm us up for some zen vibes by the breathtaking gold dome of Matrimandir. Though our affection for charming Pondy will be sky high, our great voyage must continue. Kumbakonam – we’re coming for you.Arriving in Kumbakonam in the bounds of two rivers, we’ll begin uncovering South India’s artisans by visiting a bronze casting & silk weaver’s home. By night you can dress to the inspiration of our Dharasuram temple visit, wearing a Saree or Dhotti to our included dinner. Devour a hearty breakfast and throw your worldly possessions back in your bag. A city of mesmerising history is waiting for us, and there’s a locally guided trip to Brihadeeswarah Temple in Tanjore en route.One of the oldest cities in India, Madurai is the pride & soul of Tamil Nadu. Here we’ll see a palace of great pillars, ride a rickshaw, & witness an evening procession at the awe-inspiring Meenakshi Amman Hindu Temple. Another state hop awaits us this morning, as we journey out of Madurai to Kerala, the West coast state that sways by the Arabian Sea.After our cross of the state of Tamil Nadu we’ll arrive in Kerala, ‘the land of coconuts’. We’ll pull up by the elephant & tiger reserve of Periyar National Park where we can explore a spice plantation & watch an ancient style of Martial Arts called KalaripayattuI. After a wildlife boat safari along the Periyar River, we’ll take a leisurely journey to our next destination. En route we’ll frolic through a tea factory & plantation, enjoying one of Kerala’s proudest exports.Dreamy sighs all round as we arrive in the lake region of Kumarakom. We’ll have a free evening here amidst the fresh country air, trying to contain our excitement for tomorrow’s water adventure. Waving goodbye to the agricultural lands of Kumarakom, we’ll trade one quaint setting for another. A day of boating on the beautiful backwaters are waiting on the other side of this bus ride.Arriving in the tranquil backwaters of Kerala, we’ll board a traditional houseboat made of wood, bamboo & palm leaves. Drifting past slow grazing cows, we’ll see Kingfishers darting through the forests & season our sightings with many spicy fish curries. Shed a few tears & snap your last “local climbing coconut tree” pics. Our boat will be sailing back to the shores so we can poke our way through Cochin.Back on solid ground we’ll soon find ourselves amidst the bustling spice markets and fort lands of Cochin. Here we can eat keralan delicacies, marvel at palaces, and watch the golden sun drop behind the Chinese fishing nets known as Cheena vala. It’s our final full day on tour. Wander through saree filled markets, marvel at monuments, eat your body weight in street food, or simply sit in a bookstore or café and watch the chaos and charm of Indian life passing by. Our time on tour will end in the Southern spice lands of Cochin. Having bonded deeply in these spiritual lands, we’ll say heartfelt goodbyes before going our separate ways. You'll enjoy plush hotels with twin-share rooms to refresh and revive after intense days experiencing India's magical sights and sounds. One special night will be spent adrift in the arms of a traditional Keralan houseboat, the quintessential South India experience. Prepare your tastebuds for the ultimate party of spices, fresh seafood, tropical fruits and traditional curries. You'll taste the best of north and south dished up in 29 included meals: breakfast every day, along with 5 lunches and 3 dinners, eaten off palm leaves and lapped up with parrotta bread. The rest of the time, food is up to you.